“I can tell you we have an agreement, an agreement signed by the leaders of the big four parties and I am grateful,” Hahn said after 12 hours of negotiations in Skopje ended successfully in the small hours of Wednesday. The main Macedonian parties had agreed on 2 June to hold parliamentary elections before the end of April 2016, two years early, but the Skopje talks were necessary to hammer out the details, including for an interim government and the rules of the balloting. Macedonia’s last elections were held in April 2014, with the next one due to be held in April 2018. However, the country has been enduring a deep political crisis with the government and opposition exchanging serious allegations. “The political crisis is resolved,” he declared. Zoran Zaev’s main opposition Social Democratic Union of Macedonia (SDSM) which had till now refused to participate in parliamentary proceedings, will return to the national assembly from September, he added. The opposition socialists have been boycotting parliament, claiming electoral fraud and refusing to recognise the results of last year’s polls. 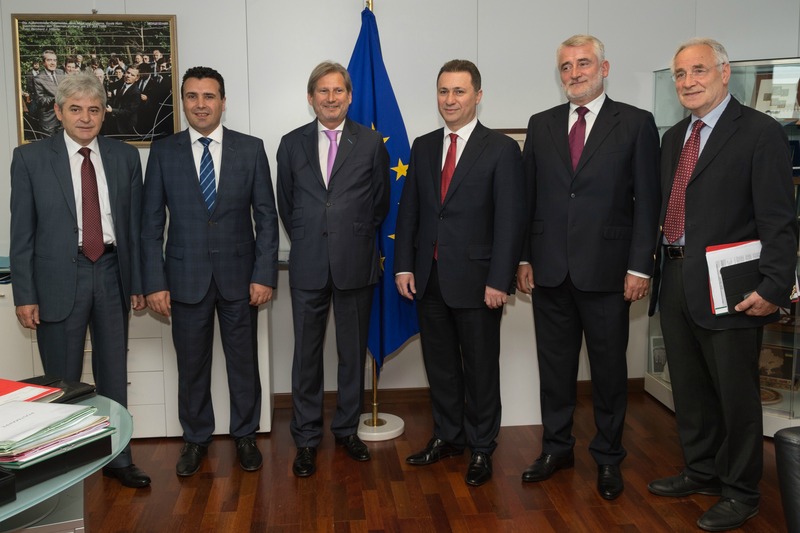 The centre-left opposition accuses Gruevski of wiretapping some 20,000 people, including politicians and journalists, as well as of corruption, a murder cover-up and other wrongdoings. The conservative government, in return, has filed charges against Zaev, accusing him of “spying” and attempts to “destabilise” the country. The crisis further deepened in May when police clashed with an ethnic Albanian armed group, whose members were mostly from Kosovo, in the northern town of Kumanovo. Eighteen people were killed in the clashes, including eight police officers. Fearing a repeat of a six-month conflict in 2001 between Macedonian armed forces and ethnic Albanians demanding more rights for their community, the international community stepped in after the Kumanovo incident and initiated political talks among political leaders. Macedonia, a former Yugoslav republic of 2.1 million inhabitants, has been in a decade-long stalemate in the process of accession to both the European Union and NATO due to a veto by Greece. Athens denies its neighbour the use of the name Macedonia, claiming to have a historical right to it. The country is an ethnic mosaic. Slavic Macedonians represent the largest group (64% of the population). Ethnic Albanians are the biggest minority (25%), with Turks (3%) and Roma (1.9%) also present. The government of Macedonia however says the majority of the population are not Slavs, but descendants from Alexander the Great. Seen from Athens, the official name used by Skopje – the Republic of Macedonia – is an open challenge to the Greek region of Macedonia. In reprisal, Greece vowed to veto Macedonia's participation in international organisations, including the EU, until the issue is resolved. Although Macedonia is recognised as the country's constitutional name by most EU countries, the name dispute with Greece has led to an impasse for the country's membership of both the EU and Nato. UK, Poland, Romania and 13 other EU countries call the country Macedonia, while France, Germany, Spain and 9 other EU members call it “former Yugoslav republic of Macedonia (Fyrom). Greece also considers that Skopje is misappropriating large chunks of its ancient history. The airport in Skopje was named after Alexander the Great, who is seen by Greece as a hero of its ancient history. Recently, Skopje angered Athens by erecting a giant statue of a ‘warrior on horseback’ resembling Alexander the Great.